Going backwards: Feds halt Obama administration’s attempt to protect the civil rights of transgender students. A day after Christian conservative Jeff Sessions was sworn into office as Attorney General, the Justice Department quietly dropped the Obama administration’s attempt to secure civil rights for transgender individuals. In reality, it is Republican lawmakers, and not transgender people, who are the real danger in public bathrooms. In fact, more GOP Lawmakers have been arrested for sexual misconduct in bathrooms than transgender people. Bottom line: The Justice Department led by conservative Christian Jeff Sessions has declared open season on transgender students, and the federal government under Trump will do nothing to protect the civil rights of transgender individuals. Donald Trump and Sen. Ted Cruz butted heads in the presidential primaries, but there’s one thing they can always agree on: discriminating against LGBTQ people under the guise of religious freedom. The First Amendment Defense Act (FADA), which Sen. Cruz is planning to introduce and Trump has said he will sign, codifies discrimination against LGBTQ people into federal law. Republicans are playing a dangerous game with the lives of LGBTQ people. FADA is likely to be just one of many attacks from the Trump-Pence administration. Recently, a White House insider leaked a draft of an anti-LGBTQ executive order. Tell Congress: Don’t legalize anti-LGBTQ discrimination. Sign the petition here. 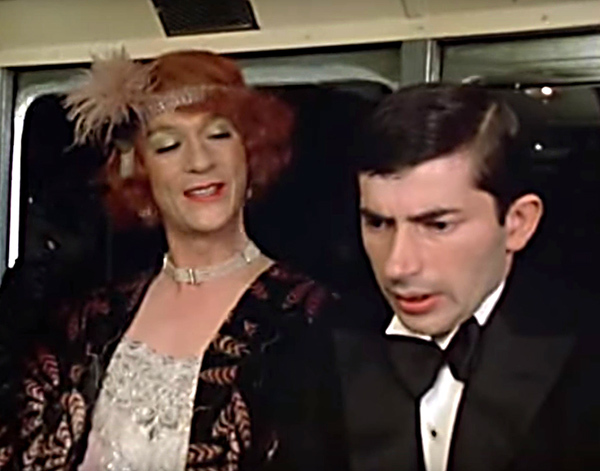 John Hurt femulates in the 1975 British television movie The Naked Civil Servant. I was thinking about writing about this but using the title "You Can Fit Genie Back Into The Closet... Or Is It The Bottle"
I refuse to go back to the 1950's. I love wearing skirts because I love to feel pretty and feminine. There is nothing wrong with that. In fact the world would be a happier place if more people did. I'd love to see Trump in one of his daughter's color block sheath dresses with a little ruffle down the side. Maybe he would understand the joy of being skirted. more republicans misbehaving in bathrooms! that is what I was thinking. Maybe if they get turned down or arrested while accosting someone in a bathroom, they want to be able to scream "transgender" to get out of it. That is why they passed the law. The big problem with a lot of these idiots is that it will cause problems in some states when a parent takes a handicapped child into a public restroom. Fortunately, probably not in my state, but others.